The BBC's Alastair Leithead has begun a week-long trip through Iraq into the Kurdish north of the country to look at the key issues as the coalition moves towards handing over power. This is the first instalment of his daily diary. Only a couple of hours out of Baghdad there's a geological fault that the Kurds say marks the end of Iraq and the start of Kurdistan. The foothills of the Jabal Harim mountains that cross the main road north are an impressive sight looming out of the morning mist. But the small Iraqi checkpoint, with its cheery and welcoming soldiers who waved as they ushered us past, is many miles from the current border with the area administered by the Kurdish authorities. Iraq's Kurds have enjoyed a huge level of independence from Baghdad for more than 10 years, thanks to the American and British fighter pilots patrolling the no-fly zone which have protected them from Saddam Hussein. Not only are they now refusing to give up their autonomy, they want a lot more. Our first destination - just another hour up the road, is Kirkuk - a city which would be the jewel in the crown for an autonomous Kurdistan, and one the divided leaders who now seem to speak with one voice would love to control. Not least because it contains more than a third of Iraq's oil reserves. It's a city where the Kurds say they are the majority amid the Arabs, Turkomans and Assyrians who make up this ethnically diverse part of Iraq. They may well be right. The Kurds stake a historic claim to it as being their city, but what they dub Saddam Hussein's "Arabisation" has shaken the region to its core and left a legacy that could again bring Iraq to its knees. Hundreds of thousands of Kurds have been displaced over the years in northern Iraq in large-scale ethnic cleansing which included the use of chemical weapons. They were driven from their homes to make way for Arabs paid to move north. Now the Kurds want their homes back. 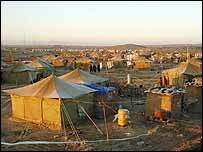 Tented cities filled with Kurds who have returned to Kirkuk since the fall of Saddam Hussein are scattered around the outskirts of the city. They are waiting and hoping to return to their homes - to the place they were born. They are not alone. The Turkomans also want their houses back, but many of the Arab settlers don't want to move. They have documents proving the land is theirs - a new judicial process should be unveiled by the Iraqi Governing Council later this week to settle land claims. It will be a long process and one that will not be satisfactory for all. How Kirkuk fits into a federal Iraq - and the proposed autonomous region of Kurdistan - is a major stumbling block in the move towards the US-led coalition handing over power to a sovereign Iraq. The Kurdish flags fly in Kirkuk and the city feels very different to the rest of the country - certainly far less tense than Baghdad - and we are not even in Kurdistan yet.